Image caption Sumire Nakamura told a press conference: "I'm happy when I win"
A Japanese schoolgirl is set to become the youngest professional player of the board game Go. Sumire Nakamura will be 10 when she enters the lowest professional rank of the game on 1 April. She began playing the complicated strategy game at the age of three and was competing in national tournaments in Japan by the time she was seven. The previous record was set by Rina Fujisawa, who was 11 when she became a professional player in 2010. "I'm happy when I win," the Osaka schoolgirl told a press conference in Tokyo on Saturday. "I want to have a title while being in junior high school." The Japan Go Association has chosen her to take part in a programme training young players to compete with Chinese and Korean players in international tournaments. 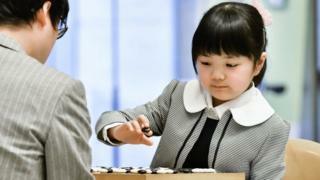 Her father, Shinya Nakamura, is also a professional player and won a national title in 1998. Go is thought to have originated in China several thousand years ago and is widely played in East Asian countries. It is a game of two players who take turns putting black or white stones on a 19-by-19 grid. Players win by taking control of the most territory on the board, which they achieve by surrounding their opponent's pieces with their own. The rules are simpler than those of chess, but a player typically has a choice of 200 moves, compared with about 20 in chess. It can be very difficult to determine who is winning, and many of the top human players rely on instinct. Video What is the game Go?